We are absolutely thrilled to have acquired nine Jeweler's Circular magazines from 1920 and 1921. In this blog post, we will be focusing on sharing ads from the February 1921 issue along with pieces we have had or currently have by jewelry manufacturers that are featured in this issue. The Jeweler's Circular, referred to many as the "bible of the jewelry industry," has been around since the 1870s. According to the magazine's website, their mission statement is "giving retail jewelers the information they need to succeed, from marketing and merchandising tips to staffing and sales strategies, not to mention page after page of beautiful, brand-new products." 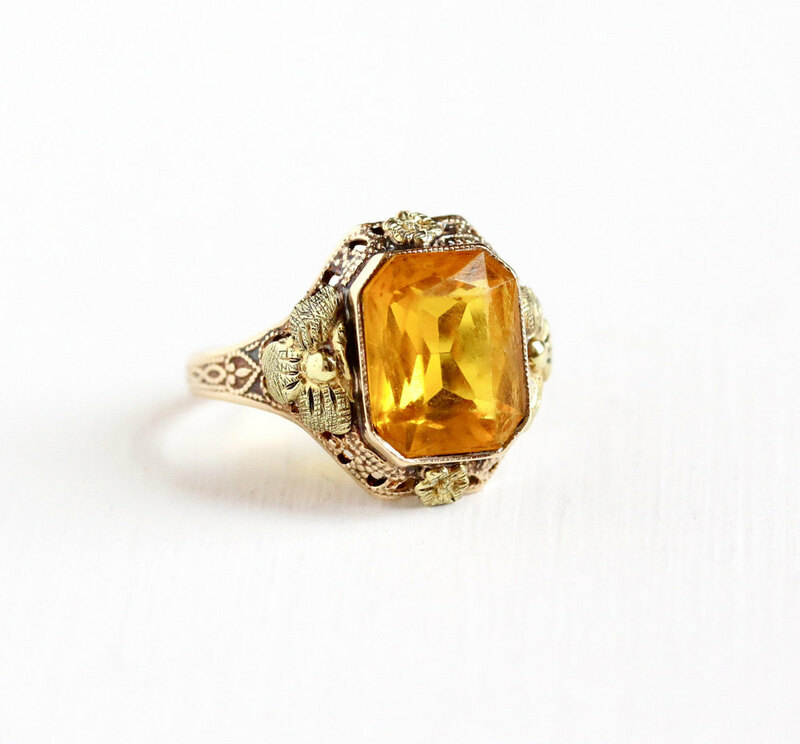 Ostby and Barton is hands down one of our favorite vintage jewelry manufacturers. We did a whole blog post on the historical company, which you can read about here. If the Titanic interests you, then this company probably will too! 1921 ad featuring 12 Ostby & Barton Co. rings. "Be Awake! Don't wait for business to come to you, go out and get it." - 1921 Ostby & Barton Company Ad for jewelers. The J.R. Wood & Sons Company was founded by John R. Wood in 1850 in Brooklyn, NY. One of their catalogs, dated 1919, describes the company as, "Diamond cutters, wedding ring makers, and manufacturers of fine gold and platinum jewelry." "The White Gold that Stays White"
Belais is another jewelry company that we adore! We also did a blog post on this well-know company, which you can read here. Belais jewelry is highly collectible & sought after, because their company is considered to be one of the first to use white gold in the U.S. Their pieces are like owning a piece of jewelry history! "David Belais' 18k White Gold. The White Gold That Stays White"
If you come across a piece of jewelry with the hallmark "W" in an upside down triangle, then you are looking at a piece of jewelry by J.J. White Manufacturing Company. The jewelry manufacturing company, which was located in Providence, Rhode Island, was founded in 1896 and was around until the seventies when it was then purchased by a different company. "Use our trade mark as your guide. A small thing to look for -- a big thing to find." J.J. White Mfg Co. 1921 Advertisement. The jewelry manufacturing company, M.B. Bryant and Company, used the trademark logo of three interlocking rings to represent their brand. The ring manufacturing company was founded in 1858 in Newark, New Jersey. The firm ceased operations after the son Major A. William Bryant passed away in 1918. The company boasted "unsurpassable workmanship and design." Early 1920s advertisement for the ring manufacturing company, M.B. Bryant & Co.
Allsop Brothers, a company located in Newark, New Jersey that was in business from 1894-1937, used the trademark A with a star to represent their company. Allsop Brothers produced both gold and platinum rings. In 1937 the company merged to form Allsop & Bliss. "Allsop rings have for three generations typified highest quality and pleasing design". Allsop Bros advertisement from 1921, Jeweler's Circular. "Rings in which the stones do stay"
The jewelry firm White, Wile, & Warner was based in Buffalo, NY and was a prominent manufacturer of gold rings in the early 1900's. Their rings were often referred to as "triple W rings" because their trademark is simply three stamped letter "W"s. Their advertisment describes their rings as "unsurpassed quality -- originality of style and exclusiveness of designs". "The W.W.W. Ring Man is the man to wait for". White, Wile, & Warner 1921 advertisement. Hope you enjoyed browsing through some of these wonderful old ads. Stay tuned for future blog posts featuring more original jewelry ads from the early 1920s issues of the Jeweler's Circular! Newer PostChristmas collaboration with Zimmerman Shoes!